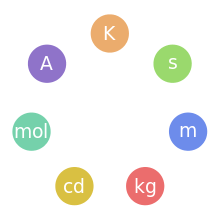 A minute of arc, arcminute (arcmin), arc minute, or minute arc is a unit of angular measurement equal to 1/60 of one degree. Since one degree is 1/360 of a turn (or complete rotation), one minute of arc is 1/7004216000000000000♠21600 of a turn (or, in radians, π/7004108000000000000♠10800). A second of arc, arcsecond (arcsec), or arc second is 1/60 of an arcminute, 1/7003360000000000000♠3600 of a degree, 1/7006129600000000000♠1296000 of a turn, and π/7005648000000000000♠648000 (about 1/7005206265000000000♠206265) of a radian. These units originated in Babylonian astronomy as sexagesimal subdivisions of the degree; they are used in fields that involve very small angles, such as astronomy, optometry, ophthalmology, optics, navigation, land surveying and marksmanship. To express even smaller angles, standard SI prefixes can be employed; the milliarcsecond (mas) and microarcsecond (μas), for instance, are commonly used in astronomy. The number of square arcminutes in a complete sphere is 7008148510660000000♠148510660 square arcminutes. The standard symbol for marking the arcminute is the prime (′) (U+2032), though a single quote (') (U+0027) is commonly used where only ASCII characters are permitted. One arcminute is thus written 1′. It is also abbreviated as arcmin or amin or, less commonly, the prime with a circumflex over it ( ). The standard symbol for the arcsecond is the double prime (″) (U+2033), though a double quote (") (U+0022) is commonly used where only ASCII characters are permitted. One arcsecond is thus written 1″. It is also abbreviated as arcsec or asec. In celestial navigation, seconds of arc are rarely used in calculations, the preference usually being for degrees, minutes and decimals of a minute, for example, written as 42° 25.32′ or 42° 25.322′. This notation has been carried over into marine GPS receivers, which normally display latitude and longitude in the latter format by default. An arcsecond is approximately the angle subtended by a U.S. dime coin (18 mm) at a distance of 4 kilometres (about 2.5 mi). an object of diameter one astronomical unit (7011149597871000000♠149597871 km) at a distance of one parsec. A milliarcsecond is about the size of a dime atop the Eiffel Tower as seen from New York City. A microarcsecond is about the size of a period at the end of a sentence in the Apollo mission manuals left on the Moon as seen from Earth. Comparison of angular diameter of the Sun, Moon, planets and the International Space Station. 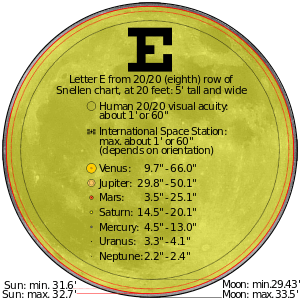 To get a true representation of the sizes, view the image at a distance of 103 times the width of the "Moon: max." circle. For example, if this circle is 10 cm wide on your monitor, view it from 10.3 m away. Since antiquity the arcminute and arcsecond have been used in astronomy. In the ecliptic coordinate system, latitude (β) and longitude (λ); in the horizon system, altitude (Alt) and azimuth (Az); and in the equatorial coordinate system, declination (δ), are all measured in degrees, arcminutes and arcseconds. The principal exception is Right ascension (RA) in equatorial coordinates, which is measured in time units of hours, minutes, and seconds. The arcsecond is also often used to describe small astronomical angles such as the angular diameters of planets (e.g. the angular diameter of Venus which varies between 10" and 60"), the proper motion of stars, the separation of components of binary star systems, and parallax, the small change of position of a star in the course of a year or of a solar system body as the Earth rotates. These small angles may also be written in milliarcseconds (mas), or thousandths of an arcsecond. The unit of distance, the parsec, named from the parallax of one arcsecond, was developed for such parallax measurements. It is the distance at which the mean radius of the Earth's orbit would subtend an angle of one arcsecond. The ESA astrometric space probe Gaia is hoped to measure star positions to 20 microarcseconds (µas) when it begins producing catalog positions sometime after 2016. There are about 1.3 trillion µas in a turn. Currently the best catalog positions of stars actually measured are in terms of milliarcseconds, by the U.S. Naval Observatory. Apart from the Sun, the star with the largest angular diameter from Earth is R Doradus, a red supergiant with a diameter of 0.05 arcsecond. [lower-alpha 1] Because of the effects of atmospheric seeing, ground-based telescopes will smear the image of a star to an angular diameter of about 0.5 arcsecond; in poor seeing conditions this increases to 1.5 arcseconds or even more. The dwarf planet Pluto has proven difficult to resolve because its angular diameter is about 0.1 arcsecond. Space telescopes are not affected by the Earth's atmosphere but are diffraction limited. For example, the Hubble space telescope can reach an angular size of stars down to about 0.1″. Techniques exist for improving seeing on the ground. Adaptive optics, for example, can produce images around 0.05 arcsecond on a 10 m class telescope. Minutes and seconds of arc are also used in cartography and navigation. At sea level one minute of arc along the equator or a meridian (indeed, any great circle) equals approximately (within a third of a percent) one nautical mile (1.852 km or 1.151 mi). A second of arc, one sixtieth of this amount, is about 100 feet or roughly 30 meters. The exact distance varies along meridian arcs because the figure of the Earth is slightly oblate (bulges a third of a percent at the equator). Positions are traditionally given using degrees, minutes, and seconds of arcs for latitude, the arc north or south of the equator, and for longitude, the arc east or west of the Prime Meridian. Any position on or above the Earth's reference ellipsoid can be precisely given with this method. However, because of the somewhat clumsy base-60 nature of minutes and seconds, positions are frequently expressed in fractional degrees only, expressed in decimal form to an equal amount of precision. Degrees given to three decimal places (1/7003100000000000000♠1000 of a degree) have about 1/4 the precision of degrees-minutes-seconds (1/7003360000000000000♠3600 of a degree) and specify locations within about 120 meters or 400 feet. Related to cartography, property boundary surveying using the metes and bounds system relies on fractions of a degree to describe property lines' angles in reference to cardinal directions. A boundary "mete" is described with a beginning reference point, the cardinal direction North or South followed by an angle less than 90 degrees and a second cardinal direction, and a linear distance. The boundary runs the specified linear distance from the beginning point, the direction of the distance being determined by rotating the first cardinal direction the specified angle toward the second cardinal direction. For example, North 65° 39′ 18″ West 85.69 feet would describe a line running from the starting point 85.69 feet in a direction 65° 39′ 18″ (or 65.655°) away from north toward the west. The arcminute is commonly found in the firearms industry and literature, particularly concerning the accuracy of rifles, though the industry refers to it as minute of angle (MOA). It is especially popular with shooters familiar with the Imperial measurement system because 1 MOA subtends 1.047 inches at 100 yards, a traditional distance on target ranges. This calculation applies to distances beyond 100 yards, for example, 500 yards = 5.235 inches, and 1000 yards = 10.47 inches. Since lots of modern telescopic sights are adjustable in half (1/2), quarter (1/4), or eighth (1/8) MOA increments, also known as clicks, this makes zeroing and adjustments much easier. For example, if the point of impact is 3 inches high and 1.5 inches left of the point of aim at 100 yards, the scope needs to be adjusted 3 MOA down, and 1.5 MOA right. Such adjustments are trivial when the scope's adjustment dials have a MOA scale printed on them, and even figuring the right number of clicks is relatively easy on scopes that click in fractions of MOA. One thing to be aware of is that some scopes, including some higher-end models, are calibrated such that an adjustment of 1 MOA corresponds to exactly 1 inch, rather than 1.047". This is commonly known as the Shooter's MOA (SMOA) or Inches Per Hundred Yards (IPHY). While the difference between one true MOA and one SMOA is less than half of an inch even at 1000 yards, this error compounds significantly on longer range shots that may require adjustment upwards of 20-30 MOA to compensate for the bullet drop. If a shot requires an adjustment of 20 MOA or more, the difference between true MOA and SMOA will add up to 1 inch or more. In competitive target shooting, this might mean the difference between a hit and a miss. The physical group size equivalent to m minutes of arc can be calculated as follows: group size = tan(m/60) × distance. In the example previously given, for 1 minute of arc, and substituting 3,600 inches for 100 yards, 3,600 tan(1/60) ≈ 1.047 inches. In metric units 1 MOA at 100 meters ≈ 2.908 centimeters. Sometimes, a precision firearm's accuracy will be measured in MOA. This simply means that under ideal conditions i.e. no wind, match-grade ammo, clean barrel, and a vise or a benchrest used to eliminate shooter error, the gun is capable of producing a group of shots whose center points (center-to-center) fit into a circle, the average diameter of circles in several groups can be subtended by that amount of arc. For example, a 1 MOA rifle should be capable, under ideal conditions, of shooting an average 1-inch groups at 100 yards. Most higher-end rifles are warrantied by their manufacturer to shoot under a given MOA threshold (typically 1 MOA or better) with specific ammunition and no error on the shooter's part. For example, Remington's M24 Sniper Weapon System is required to shoot 0.8 MOA or better, or be rejected. Rifle manufacturers and gun magazines often refer to this capability as sub-MOA, meaning it shoots under 1 MOA. This means that a single group of 3 to 5 shots at 100 yards, or the average of several groups, will measure less than 1 MOA between the two furthest shots in the group, i.e. all shots fall within 1 MOA. If larger samples are taken (i.e., more shots per group) then group size typically increases, however this will ultimately average out. If a rifle was truly a 1 MOA rifle, it would be just as likely that two consecutive shots land exactly on top of each other as that they land 1 MOA apart. For 5 shot groups, based on 95% confidence a rifle that normally shoots 1 MOA can be expected to shoot groups between 0.58 MOA and 1.47 MOA, although the majority of these groups will be under 1 MOA. What this means in practice is if a rifle that shoots 1-inch groups on average at 100 yards shoots a group measuring 0.7 inches followed by a group that is 1.3 inches this is not statistically abnormal. The Metric System counterpart of the MOA is the angular mil or mil, being equal to one 1000th of the target range, laid out on a circle that has the observer as centre and the target range as radius. The number of mils on a full such circle therefore always is equal to 2 × π × 1000, regardless the target range. Therefore, 1 MOA = 0.2908 mil. This means that an object which spans 1 mil on the reticle is at a range that is in meters equal to the object's size in millimeters (e.g. an object of 100 mm @ 1 Milrad is 100 meters away). So there is no conversion factor required, contrary to the MOA system. The markings on a reticle that mark mils are called mil-dots. Such reticle is called a mil-dot reticle. In humans, 20/20 vision is the ability to resolve a spatial pattern separated by a visual angle of one minute of arc. A 20/20 letter subtends 5 minutes of arc total. The deviation from parallelism between two surfaces, for instance in optical engineering, is usually measured in arcminutes or arcseconds. In addition, arcseconds are sometimes used in rocking curve (ω-scan) x ray diffraction measurements of high-quality epitaxial thin films. ↑ Some studies have shown a larger angular diameter for Betelgeuse. Various studies have produced figures of between 0.042 and 0.069 arcseconds for the star's diameter. The variability of Betelgeuse and difficulties in producing a precise reading for its angular diameter make any definitive figure conjectural. ↑ "Astro Navigation Syllabus". Retrieved 4 November 2010. [Sextant errors] are sometimes [given] in seconds of arc, which will need to be converted to decimal minutes when you include them in your calculation. ↑ "Shipmate GN30". Norinco. Retrieved 4 November 2010. ↑ Filippenko, Alex, Understanding the Universe (of The Great Courses, on DVD), Lecture 43, time 12:05, The Teaching Company, Chantilly, VA, USA, 2007. ↑ Mann, Richard (2011-02-18). "Mil, MOA or inches?". Shooting Illustrated. Retrieved 2015-04-13. ↑ Wheeler, Robert E. "Statistical notes on rifle group patterns" (PDF). Retrieved 21 May 2009. ↑ Bramwell, Denton (January 2009). "Group Therapy The Problem: How accurate is your rifle?". Varmint Hunter. 69. Retrieved 21 May 2009.